The 9 Best Doughnut Shops in West Virginia! These little deep-fried morsels of doughy deliciousness have been satisfying sweet cravings for centuries, and are considered an American invention. There’s even a National Donut Day, observed the first Friday in June each year in the U.S. Whether you prefer the heavier cake style or the lighter yeast-raised kind, West Virginia has it. You’ll find nine of the best doughnut shops in West Virginia below, so the next time you’re craving one of these sweet treats, check out one of the shops to satisfy your yearning. If you loved the 1970s, you’ll love Peace, Love and Little Donuts in Huntington, West Virginia. This funky little shop is the hippest thing around, serving up groovy flavors for cool hipsters that have the craziest toppings around like maple bacon, salted chocolate, Boston cream pie, and Samoa. Doughnuts are made daily from the freshest ingredients available. “Donuts fit for a king” is the motto of JR’s Donut Castle located in Parkersburg, West Virginia. This royal establishment has been around since 1969, and has a bakery and coffee shop on premise. All doughnuts are made fresh daily using the same time-tested recipe for over 30 years. Why change when you have achieved perfection? For over 40 years, McHappy’s has been making fresh, preservative-free baked good every day. Using the same recipes since the beginning, the promise to customers is a large selection of homemade products combined with fast, friendly service. Try their fresh blueberry doughnut, chocolate or maple cream-filled doughnuts, or jumbo cinnamon buns. They also offer full breakfast delivery for a small fee. For over 65 years, this little family-owned pastry shop has been baking up sweetness and yummy treats. Known for their famous “hot dog” pastry, a cream-filled éclair drizzled with chocolate and powdered sugar, they also design cakes for special celebrations. Closed on Sunday and Monday, everything is baked fresh every day, and you can choose from a wide selection of pies, pastries, doughnuts, breads, and cookies. Get your doughnut on at the Donut Shop in Buckhannon, West Virginia. Known for their amazing flavors, like peanut butter delight, this little shop has a late-night bakery when you’re craving something sweet after hours. Friendly staff, good prices, and delicious doughnuts. What more could you want? Long Johns, brownies, homemade fudge, cupcakes, doughnuts, and pepperoni rolls are just a few of the delicious baked goods available at Nu Era Bakery in Logan, West Virginia. Originally opened in 1940, Nu Era Bakery is bringing the best of the past into the present with a new line of deli sandwiches, soups, salads, and breakfast baked goods. Mouthwatering glazed, chocolate-covered, cream-filled, jelly or fruit-topped doughnuts are just a few of the kinds available at Gus’s Goodies in Weirton, West Virginia. Having a bad day? Try one of the famous cinnamon rolls or apple fritters. Your day will definitely get better. What do Angels and Bavarians have in common? They’re doughnuts available at The Donut Connection in Charleston, West Virginia, along with various fruit, cream, sugar, and chocolate-filled baked goods. In addition to a great selection of doughnuts, customers can purchase delicious cakes, bagels, and other baked items to go with their coffee, also available on premise. 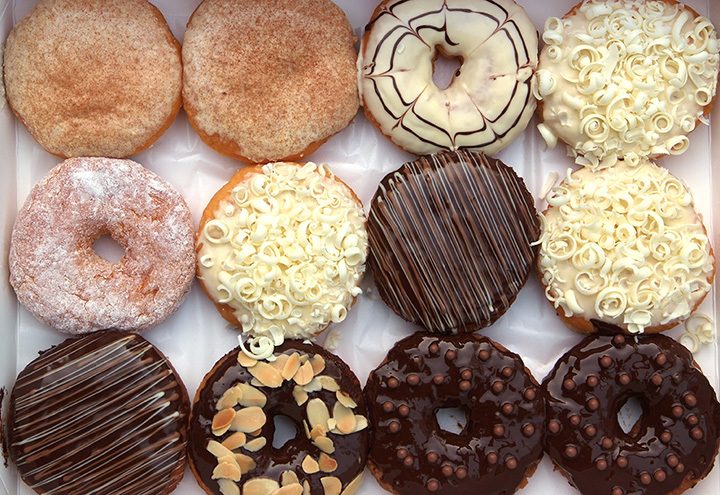 If you think doughnuts come from Paradise, you’re right. Paradise Donuts in Huntington, West Virginia, that is. Made fresh every day from the best ingredients available and sold until they’re gone, you’ll find something to tantalize your taste buds. It might be the French toast, blueberry streusel, or maple bacon doughnuts, or maybe you’re more of a traditional classic glazed doughnut lover. Whatever your favorite is, you’ll find it here, and then some.